Cuter than Happy Sunday! Review of Dad, Where Are We Going? Yes, that is a picture of a kid petting puppies. I admit it is beyond adorable. Awwwwwwww times one thousand. A mouthful of words and embarrassing life moments aside I started watching MBC’s newest Sunday variety show Dad, Where are we going and I am completely hooked. DWWG features five celebrity Dads and their children as they go on trips together. Airing on Sunday nights this show goes against the KBS and SBS blocks of Sunday night entertainment that include 1 Night 2 Days and (heart you) Running Man. The ratings for DWWG have continued to rise since its January premier and is now overtaking 1N2D and inching in on Running Man. While I would hate to see this show overtake RM I have to give it some props, it is a mighty fine look at awkward dads and cute kids. Now on to the details! Min Gook is the hyung of the children and shows a sense of responsibility mixed with an ever pervasive desire to whine. Sung Joo admits he has given into his son’s whining time and time again, leaving the child to act this way. Min Soo was / is a member of Vibe (sorry, unfamiliar with the group) and parents with a light heart. Hoo is a boisterous kid who has recently begun to notice girls- he follows Jia around with the adorableness of a basketful of kittens and puppies. With bows. Pink bows. Dong Il did not have children until after he turned 40, he is the oldest of the dads. During episode one Dong Il admitted that he did not see his own father after he turned ten, leaving him to act as a strict and distant father to Song Jun. Song Jun is quiet and shy but shows responsibility when needed. 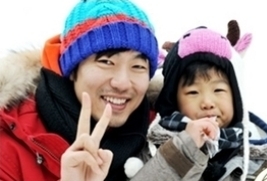 A big kid at heart, Jong Hyuk is sometimes upstaged by his son in the maturity game. Junsu is a silly and lighthearted kid that brings an overload of cuteness. Song Jia is a Daddy’s girl through and through and she is extremely adorable. Jong Gook is wrapped around his daughter’s little finger and would do anything for her. The subject of scripting which has plagued many a Korean variety show of late is not an issue here. It really can’t be- these kids obviously do what they want (though I do not doubt we have the basics of scene set ups and premises, just not verbal scripting). That alone makes this show refreshing. In addition the Dads and their varying personalities are a hoot to watch as well- after all five awkward dads are better than one. The basic setup is not to be missed- there is something humorous about taking Dads and forcing them to spend quality time with their children. In many cultures children spend far more time with their mothers than their fathers leading to a logical feeling of greater comfort with Mom. Part of this fact (whether it is bad or good) is why this show translates so well- the scenes bridge cultures and display international emotional relevance in a fun way. After all, most of us have probably had that uncomfortable moment when Dad had to take care of us- had no idea how to cook, burnt food, looked puzzled when we cried, and just tried to make us be quiet when we whined. While Mom was the master of family life Dad was the guy who was a little far off in the distance, around but not the shoulder we cried on. DWWG takes all of that awkwardness and tries to give the Dads and the kids’ memorable trips that take the mom factor out and throw the Dad factor into full gear- Dad is feeding the kids, bathing them, and doing all of that other stuff that Moms often end up being fully responsibility for. Aside from the Dad / Mom role mix-up the kids make this show. Their larger than life personalities which are really just children being children are addicting to watch. From their odd take on things (Kids say the darnedest things!) to their relationships with each other (Yoon Hoo as a young romeo, Min Gook as the ever responsible Hyung) this gang of five is refreshingly hilarious to the point that I start to think that kids are kind of fun. Just don’t tell my Mom I said that. She may start with the grand-kids talk. My puppies would get jealous and my husband may get the wrong idea. Shhhhhhhhh! I recommend you tune into this-and cheers.